Coney Island's streets, buildings, public beach and boardwalk may be a bit down at the heels, but it remains a one-of-a-kind destination. 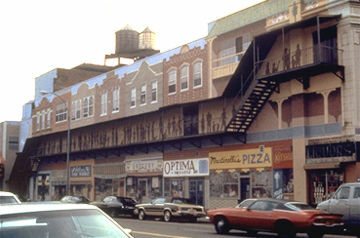 This urban destination has a panoramic range of activities for all ages, many of which originated at Coney Island - such as hotdogs. While the island is easily accessible from all parts of the city, it feels far removed, given its unique spirit and location on the water. Contributing to the festive atmosphere and unique skyline are the famous Cyclone roller coaster, a Ferris wheel, and many other rides and structures, some remnants of amusement parks now closed. 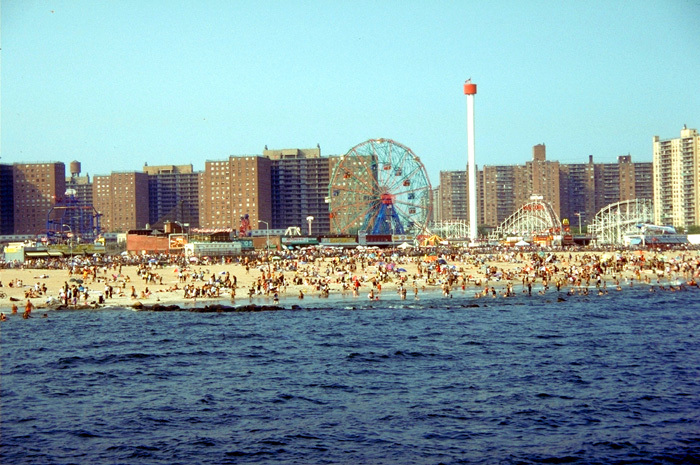 During the summer months, the beach, boardwalk, and amusements are jammed with people who arrive on any one of the four city subway lines that terminate there. Participating in the world-famous action seems to make visitors feel that a bit of the area's character and vitality is rubbing off onto them. As noted in the "history and background," part of the allure of Coney Island is its accessibility. Most people arrive by one of the four subway lines that end here. The station has concessions itself and was designed with something of character that surrounds it. The main street that parallels the beach feels like a cruising boulevard, with active food and retail business spilling out onto its sidewalks. The main amusement park corridor is narrow with entrances that draw you in, beckoning with constant activity and visual variety on either side. The boardwalk is accessed by gradual steps from the perpendicular streets. Strollers and people watchers fill the wide boardwalk and flow out onto the beach. While the overall image is unrefined, somewhat disorganized, and a little dirty, and it cannot be considered a peaceful or relaxing place to be in any traditional sense, these informal qualities are all part of its attraction. 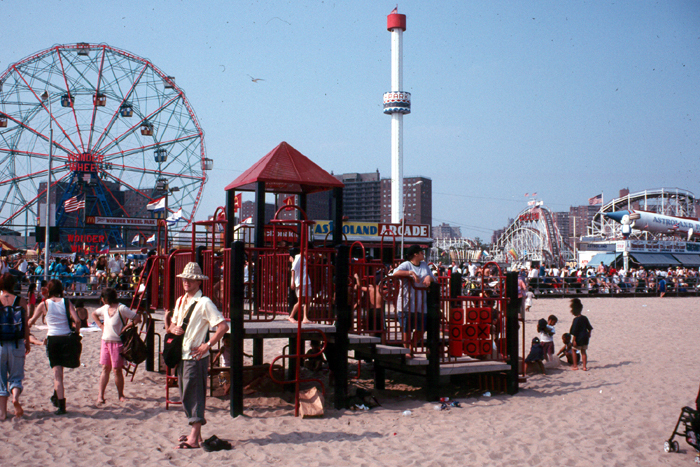 Much of the image of Coney Island is imbedded in its history. Sunning and swimming, games and rides, eating hotdogs, strolling the boardwalk - visitors can feel driven to take part in as many of these activities as possible. Everyone who goes to Coney Island is part of the show. Whether you are walking the boardwalk, waiting for a hotdog, or riding the Cyclone, you share the experience with the people next to you and feel connected to them, as well as to people who have shared the experience before. While direct interaction between strangers is common, for the most part people enjoy watching others, being watched and merely participating in the vital social life. 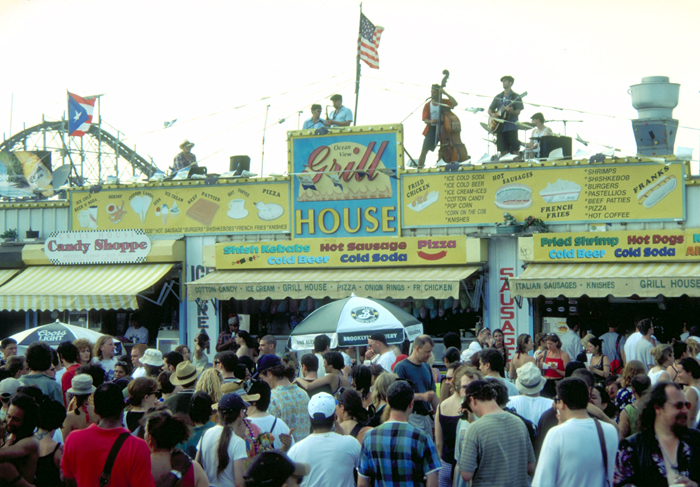 Coney Island has spangled on Brooklyn's south shore for over one hundred years, undergoing several transformations. It was first developed as an upper-class tourist resort. Soon five railroads connected the area to Brooklyn, and more attractions of broader appeal were built, including horseracing tracks and arenas for boxing matches - while associated gambling dens, dance halls, and brothels brought a hint of the illicit. More middle-class attractions were also developed by concessionaires. The first visionary to arrive on the scene was George Tilyou, who, in hopes of making the island into a "family place," built an amusement park (Steeplechase Park) that charged an entrance fee and offered exciting mechanical rides. Steeplechase Park boasted a ferris wheel similar to the one Tilyou had seen at the Chicago World's Fair in 1893. By 1897, one guidebook said, "Coney has risen sphinx-like." Two of Tilyou's former employees built another park, the fantastical Luna Park, in 1903, followed in 1904 by Dreamland, which was designed in the 'classier' Beaux-Arts style (also inspired by the 1893 World's Fair), but never fared as well as Tilyou's. Attendance at Coney Island in 1904 averaged 90,000 people per day. 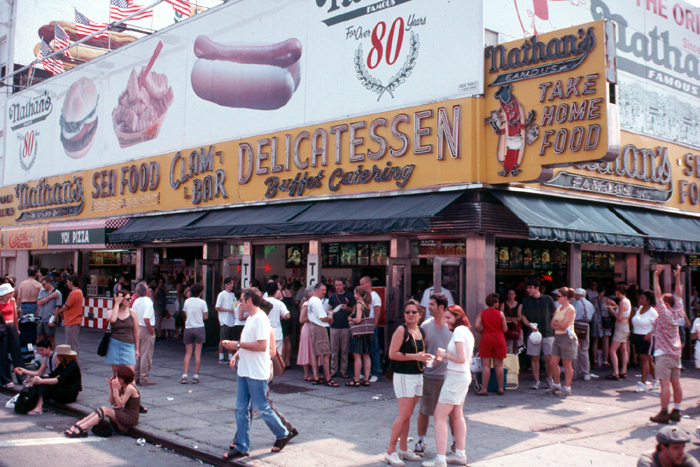 When the subway reached Coney Island in 1920, it achieved mythic status as the "Nickel Empire": It cost a nickel to get there, a nickel for the rides, and a nickel for one of Nathan's famous hotdogs. (In some parts of the world, hotdogs are still called "Coneys.") Affordable and accessible now even to those with little money, it had become a true family place, and a million people came every day to enjoy the fun, strolling along the boardwalk added in 1923. Clever visitors could find enough pocket change under the boardwalk to finance a few extra rides. 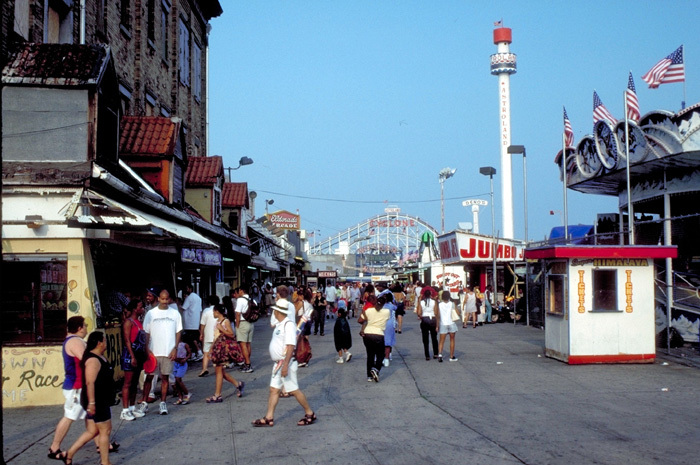 Coney Island barely survived the Depression and began a serious decline in the 1940s. Luna Park caught fire in 1944 and closed in 1949. Robert Moses, New York City's powerful Parks Commissioner from 1934 until 1960, was against commercialism and wanted to end the reign of what he called the "mechanical gadget resort." City planners agreed and began to tear down the remaining amusement parks and replace them with high-rise residential buildings. (Also at Moses' direction, construction of Jones Beach began nearby, designed with 'wholesome' activities and overpasses that prevented public buses from accessing the beach, reserving it for the car-owning classes). 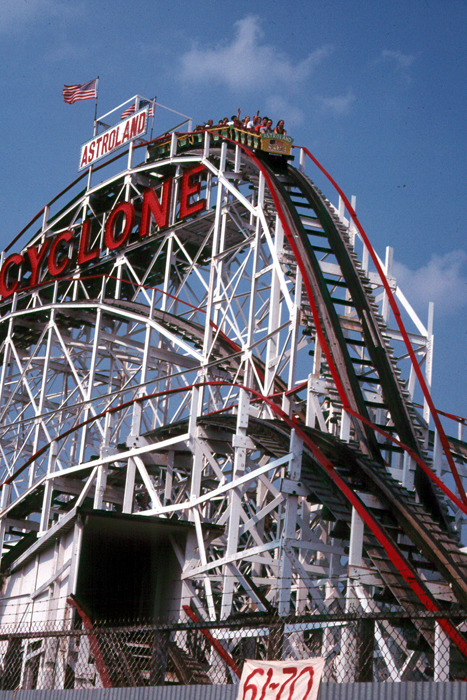 One of Coney Island's most famous rollercoasters, the Cyclone, was saved along with a few other rides, but the heyday of Coney Island had come to an end. People love to be a part of the crowds. The famous Cyclone roller coaster. A scene on the boardwalk. Colorful mural along one of the area's streets.